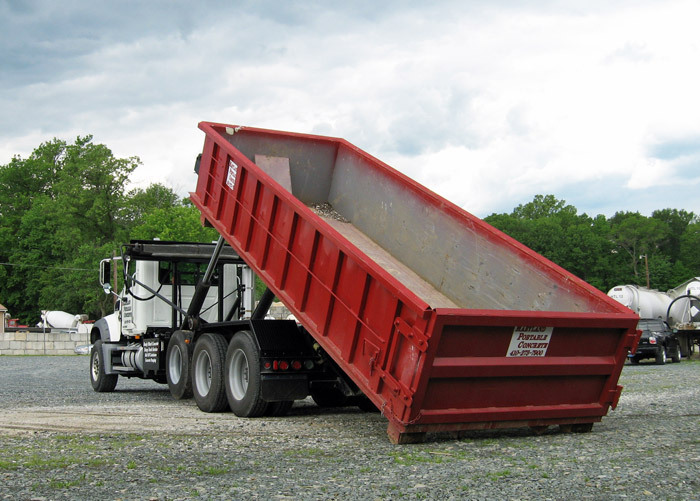 Maryland Portable Concrete offers roll-off dumpsters for trash and rubbish removal in Maryland and Delaware. MPC provides quick and convenient drop-off and pick-up of roll-off containers and portable dumpsters throughout Aberdeen, Baltimore, Bel Air, Delaware and southeastern PA. Our roll off dumpsters are perfect to assist in your construction, commercial or residential trash clean up project. Our newly expanding roll-off dumpster service is every bit as prompt and reliable as our ready-mixed concrete service has become over the past 30 years. One call to our plant dispatch will provide you with the answers to any questions concerning your roll-off container and roll off dumpster needs in and around Harford County, Maryland. We offer fast same-day rental service, reasonable pricing, and all sizes of containers from mini 11-yard cans to clean up trash from a garage or basement, all the way through huge 40-yard dumpsters for general land clearing and construction debris. See the table below for exact dimensions and capacities. Maryland Portable Concrete can also provide you with our specially designed, completely portable, ready-mixed concrete washout containers. These water-tight containers are designed to hold any cementitious products and the associated rinse water, preventing these pollutants from harming the environment. Our portable concrete washout containers eliminate the need for costly, space consuming, hand dug holes that do nothing to prevent the caustic water from leaching into the surrounding ground. They also provide an environmentally "green", cost effective alternative for construction sites, housing developments, and jobsites of any size requiring ready-mixed concrete. Once the concrete washout container is full MPC will pick it up and recycle 100% of the caustic water and cementitious contents. Please call us at 410-273-7900 for roll-off dumpster service, and allow us to show you the MPC difference! throughout Harford County, Cecil County, Baltimore County, Delaware, and southeastern Pennsylvania.